Hitching Stone on Keighley Moor. OS grid reference: SD 9866 4170. 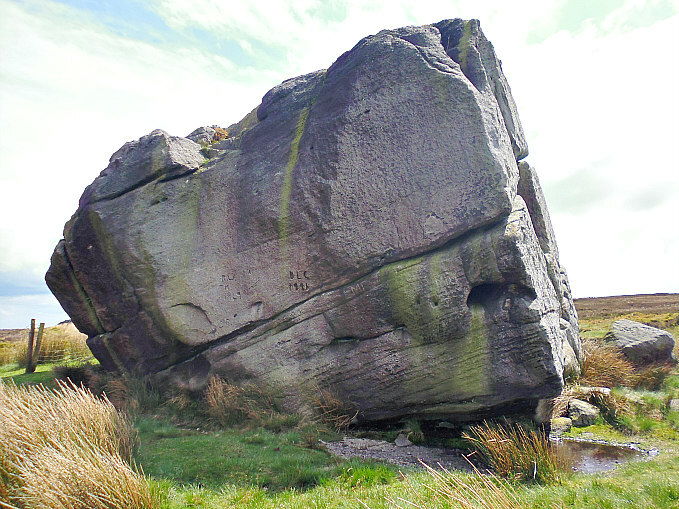 At the western side of Keighley Moor, between Cowling and Keighley, stands a huge gritstone boulder called ‘Hitching Stone’. The stone stands on the Lancashire—Yorkshire border and also parish boundaries. Hitching Stone is in fact an erratic boulder which was deposited here many thousands of years ago by a retreating glacier at the end of the last Ice Age. There are some in-teresting myths and legends associated with this huge boulder, not all of them being plausible. The stone can be reached from Buckstone Lane to the east of Cowling. There is a small carpark for Wainman’s Pinnacle. Take either of the two footpaths opposite this carpark and head south onto the moor for around 880m; the footpaths cross some quite boggy land and a couple of streams, but keep close to the wall all the way to Hitching Stone. You can’t really miss it as the huge boulder stands out on the landscape for several miles! Hitching Stone (closer up) the north and west faces. 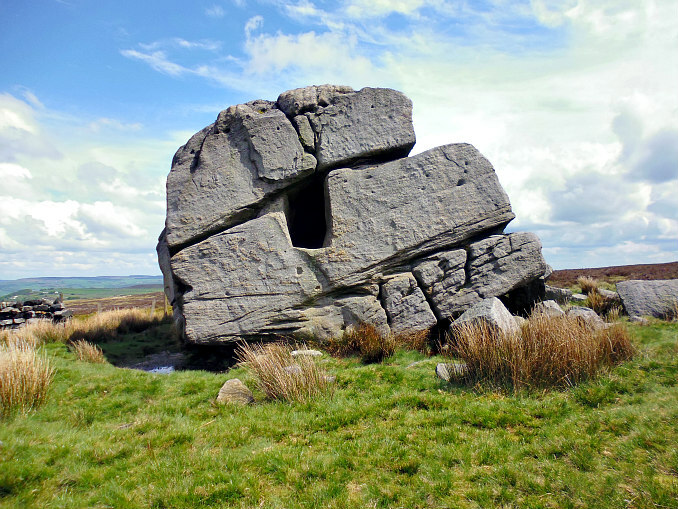 Hitching Stone is a huge, almost square-shaped block of gritstone that is probably as large as a small house, well it is 21 feet high, and is almost 30 feet long and 25 feet wide, and is said to weigh well over 1,000 tonnes. 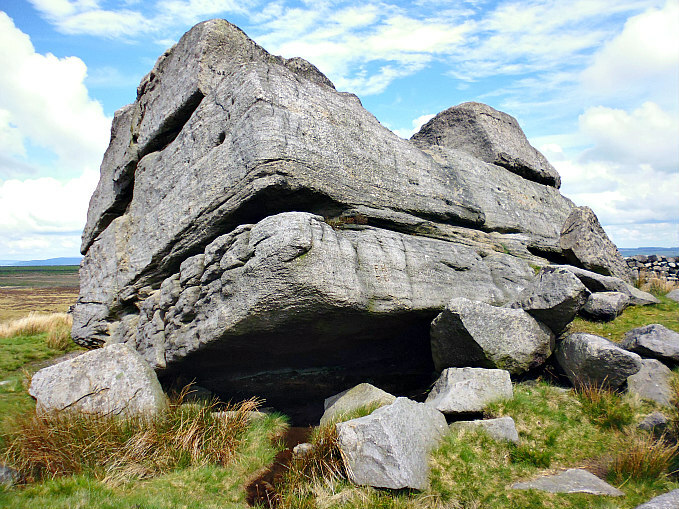 It probably originally came from Earl Crag up above Cowling, which is just over a mile to the north. At the last Ice Age 12,000-14,000 years ago the great boulder was scooped up by a retreating glacier, and as it moved southwards the ‘object’ was deposited in its current location – rather like it was ‘hitching a lift’, and that might be where the name “Hitching” comes from, or a giant carried the stone from Rombald’s Moor – though that giant could have been the retreating glacier! 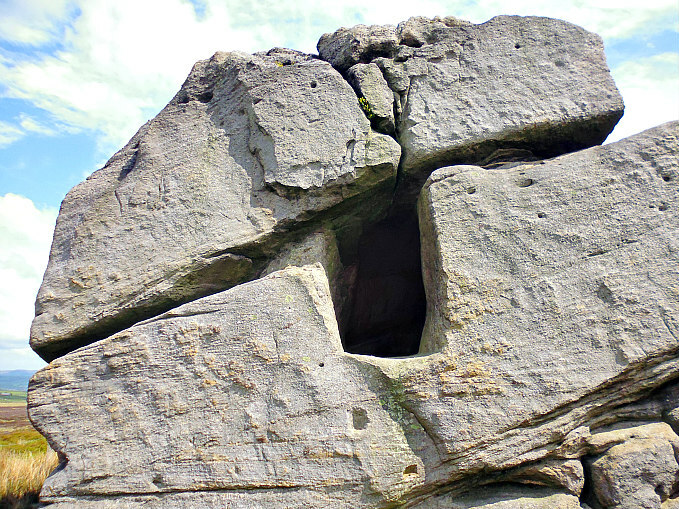 Another legend says a witch from Ilkley pushed or threw the stone across the moor to its current position! 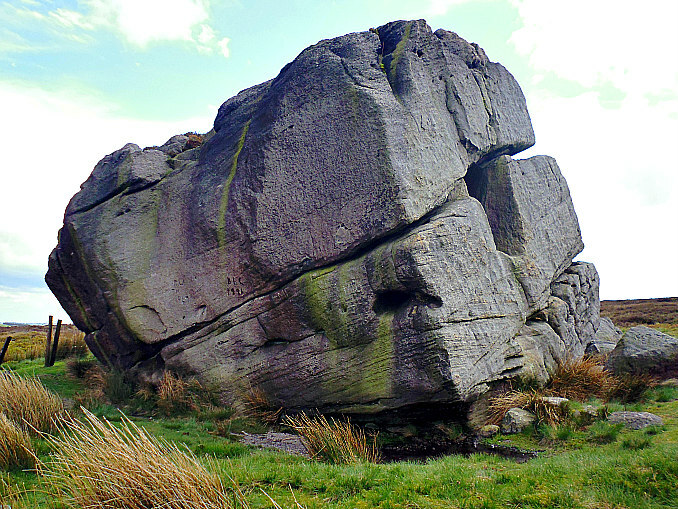 It is reputed to be Yorkshire’s largest boulder. Hitching Stone (west face showing fissure and rectangular hole). About half-way up the west face of the stone is a large rectangular-shaped dark hole (recess)which seems to go quite along way into the stone, similar perhaps to a tiny cave, but it would seem that a large stone of a ‘different type’ was originally embedded into it; this eventually eroded away leaving the large, natural hole. This has sometimes been called ‘The Druid’s Chair’- harking back to more ancient, magical times, perhaps. Just above that is a long fissure (tube) that runs through the whole of the N and W faces. This fissure was originally filled by a fossilized tree which eroded away leaving the massive crack across the stone, almost cutting the top half in two. On the top of the stone there is a hollowed-out basin that is 3 foot deep and usually filled with rainwater; indeed this natural pool of water is never said to dry-up even in hot, dry conditions. Hitching Stone (the south-east side). Sharpe goes on to say that: “Local tradition claims that the Winter Solstice sunrise is from behind the Hitching Stone, when viewed from the cup-marked and aptly named ‘Winter Hill Stone’. In the same fashion…..the Vernal Equinox sunrise (from) behind the Hitching Stone is in alignment with Pendle Hill.” The Winter Hill Stone is roughly 500 yards to the north-west of Hitching Stone. Sharpe, Thomas, The Pendle Zodiac, Spirit Of Pendle Publishing, 2012. Categories: Glacial Erratic | Tags: Hitching Stone Near Cowling in West Yorkshire | Permalink.